The great auk, Pinguinus impennis, was a large, black and white bird that was found in huge numbers across the North Atlantic Ocean. It was often mistaken to be a member of the penguin family, but its closest living relative is actually the razorbill, and it is related to puffins, guillemots and murres. Being flightless, the great auk was particularly vulnerable to hunting. Humans killed the birds in their thousands for meat, oil and feathers. By the start of the 19th dentury, the north-west Atlantic populations had been decimated, and the last few remaining breeding birds were to be found on the islands off the south-west coast of Iceland. But these faced another threat: due to their scarcity, the great auk had become a desirable item for both private and institutional collections. Between 1830 and 1841 several trips were taken to Iceland's Eldey Island, to catch, kill, and sell the birds for exhibitions. 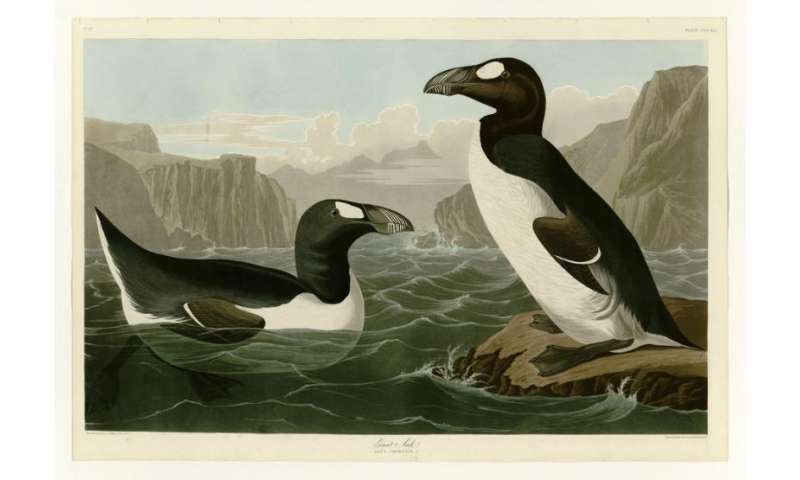 Following a period of no reported captures, great auk dealer Carl Siemsen commissioned an expedition to Eldey to search for any remaining birds. Between June 2-5 1844, 14 men set sail in an eight-oared boat for the island. Three braved the dangerous landing and spotted two great auks among the smaller birds that also bred there. A chase began but the birds ran at a slow pace, their small wings extended, expressing no call of alarm. They were caught with relative ease and killed, their egg, broken in the hunt, was discarded. But the birds – a male and a female – were never to reach Siemsen. The expedition leader sold them to a man named Christian Hansen, who then sold them on to Herr Möller, an apothecary in Reykjavik. Möller skinned the birds and sent them, and their preserved body parts, to Denmark. The internal organs of these two birds now reside in the Natural History Museum of Denmark. The skins, however were lost track of, and – despite considerable effort by numerous scholars – their location has remained unknown. In 1999, great auk expert Errol Fuller proposed a list of candidate specimens, the origins of which were not known, which he believed could be from the last pair of great auks. But how to find which of these were the true skins? For this we turned to the field of ancient DNA (aDNA). In the last 30 years, aDNA technology has progressed greatly, and has been used to address a wide range of ecological and evolutionary questions, providing insight into countless species' pasts, including humans. 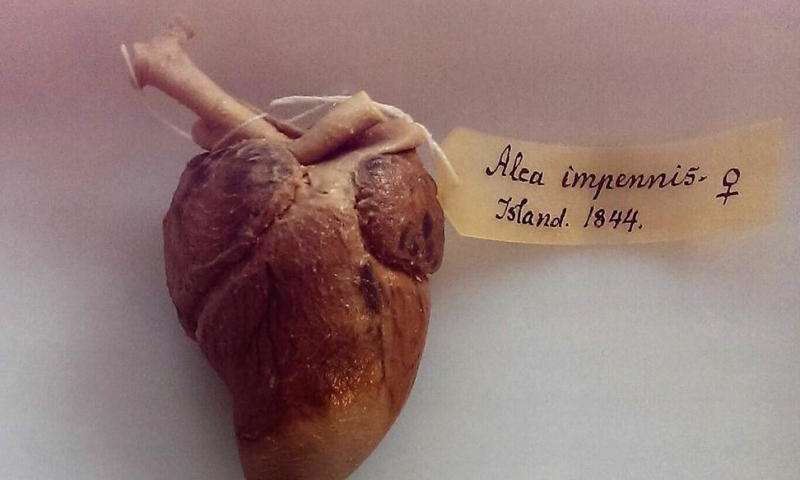 Museum specimens play a key role in aDNA research and have been used to solve several issues of unidentified or misidentified specimens – for example Greenlandic Norse fur, rare kiwi specimens, Aukland island shags, and mislabelled penguin samples. We took things a step further, using aDNA techniques and a detective-like approach to try and resolve the mystery of what happened to the skins of the last two great auks. We sampled the organs from the last birds, along with candidate specimens from Brussels, Belgium; Oldenburg and Kiel, in Germany; and Los Angeles. We then extracted and sequenced the mitochondrial genomes from each, and compared the sequences from the candidate skins to those from that came from the organs of the last pair. The results showed that the skin held in the museum in Brussels was a perfect match for the oesophagus from the male bird. Unfortunately, there was no match between the other candidate skins and the female's organs. The specimens from Brussels and Los Angeles were thought to be the most likely candidates due to their history: both birds were in the hands of a well-known great auk dealer, Israel of Copenhagen, in 1845. As the bird in Brussels was a match, we thought it likely that the one in Los Angeles would also be a match for the female's organs. It was surprising when it wasn't. However, our research led us to speculate that a mix up which occurred following the death of Captain Vivian Hewitt in 1965 – who owned four birds which are now in Cardiff, Birmingham, Los Angeles and Cincinnati – was not resolved as once thought. The identity of the birds now in Birmingham and Cardiff are now known after photographs were used to identify them – but those in Los Angeles and Cincinnati have been harder to determine. It was thought that their identities could be found from annotated photographs taken in 1871, but we speculate that they were not correctly identified, and that the bird in Cincinnati may be the original bird from Israel of Copenhagen. If this is the case, then it could explain why the Los Angeles bird fails to match with either of the last great auk organs held in Copenhagen. We now have permission to test the great auk specimen in the Cincinnati Museum of Natural History and Science, and hopefully solve this final piece of a centuries-old puzzle. There is no guarantee that this bird will be a match either, but if it is, we will finally know what happened to the last two specimens of the extinct great auk. Which extinct ducks could fly?